The pressure comes from all around (our parents, teachers, spouses, co-workers, and friends) telling us it's more important to be liked and to fit in than it is to be who we truly are. We are also constantly bombarded with messages telling us that we aren't good enough and need to be fixed. 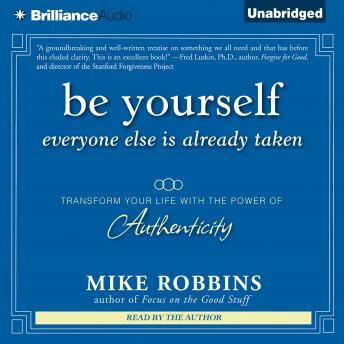 Now, best-selling author and motivational speaker, Mike Robbins shows you how to overcome your fear about being who you really are and accept yourself without a mask, pretentions, bluff, or fakery. This encouraging audiobook will help you confront some of your own personal challenges with honesty and genuineness. It contains powerful ideas, principles, and practices that when integrated into your life can help you access a deeper place of truth within you. Be Yourself, Everyone Else Is Already Taken will empower you to •Express yourself fully and confidently •Deal with conflicts directly and resolve them effectively •Take risks and go for what you truly want in life •Keep things in perspective and have more fun •Have more freedom, peace, and confidence in your relationships, your work, and your life Being your authentic self is not for the faint of heart, but once you truly engage and do the work to become real, your life will be more exciting, meaningful, and fulfilling! Great Book with alot of great practiced to put in to place. The book gives you alot of what you should already know but its packaged in the best way possible for a result oriented person...I can definitely say I am more myself thanks to listening to this book.